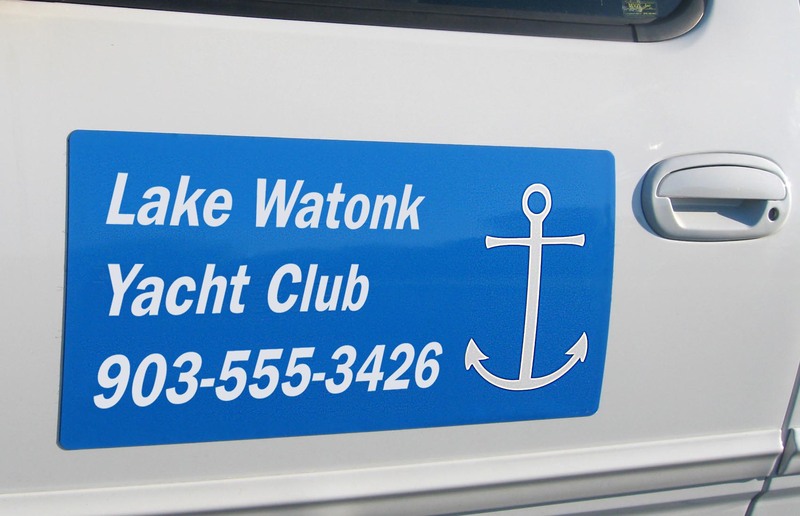 Magnetic signs are a low cost alternative to lettering directly on a vehicle. 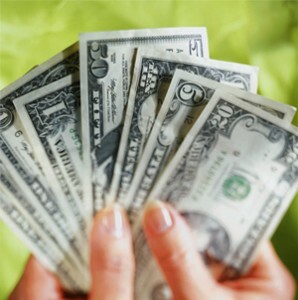 Because a customer can easily put them on and then remove them, they are extremely popular for many small businesses. So magnetic signs are a staple of any complete sign making shop. They can offer two very important ingredients for sign business success: high margins and new customers. But there are some important caveats to magnetic signs and a few limitations to consider. Let’s take a closer look at magnetic substrates considering the required tools, target market, your equipment options and finally, the care and maintenance requirements. 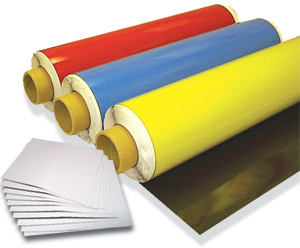 Flexible magnetic substrate rolls and magnetic paper (lower left). Fig 2. 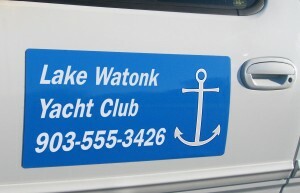 Technically magnetic signs are simply vinyl graphics from your vinyl cutter applied to a magnetized flexible substrate. These substrates come in two varieties: magnetized vinyl and magnetized paper. Magnetized vinyl is typically 12 to 30 mil in thickness and is designed for use with self adhesive vinyl (or large format digital printing; more on that later). It is available in white and a few popular colors with a gloss or matte finish. Choosing gloss or matte, red or white is strictly a matter of personal preference. But there are important distinctions between magnets of varying thickness. The thicker the magnet, the more magnetic property it has. This is critical because the stability of a magnetic sign resides entirely in its pull strength. Pull strength is the magnet’s resistance to lifting. This is measured in grams/in or grams per cm2. Our EnduraMAG 12” x 24” sheets have a measured pull strength of 41.5 g/cm2. That’s roughly ten times that of a high performance cast vinyl. This level of pull force, which is more than sufficient to resist peeling off of a vehicle door at highway speeds (make sure you round the corners), is found only in 30 mil magnetic sheeting. 12 and 20 mil magnets are fine for use as temporary signs on buildings, filing cabinets, industrial worksites or other metallic surfaces, but will probably not prove satisfactory as vehicle graphics. Speaking of surfaces, we should note here that not all metallic surfaces will work. Magnets will not stick to non ferrous metals and alloys including aluminum and stainless steel. There are surfaces that look like they should hold magnets that don’t. These include Corvette bodies. Chevrolet Corvette body parts have always been made from fiberglass. Other modern vehicles use aluminum door panels to reduce weight. Rarer vehicles such as race cars might use carbon fiber. You’re more likely to have trouble with doors made from plastic composites such as those found on some GM minivans. What about magnetized paper? This is a small format inkjet substrate designed for use in desktop printers. Typically this is an inkjet coated paper magnetized in sheets 6 to 8 mil thick. These are ideal for craft and hobby applications. Because of their thinner construction and relatively weak magnetic properties, these papers can be used with most vinyl cutters including the Graphtec Silhouette, Craft ROBO PRO, and CE5000 series and vinyl EXPRESS Qe60+ and Q Series plotters. To be useful for these small scale print & cut processes, the cutter must have an optical registration mark sensor installed. Magnetic paper can also be used with a standard trimmer to produce full color magnetic business cards. For these applications, SignWarehouse carries DigiMag 8 mil magnetic paper, which can be easily cut with an EnduraTrim trimmer, a simple 12” Shear cutter, or any of the plotters noted above. 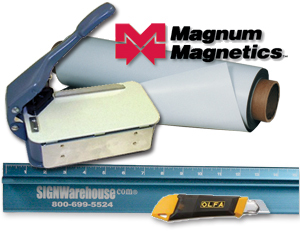 For making magnetic signs with 30 mil sheeting, you only need a few simple tools: a heavy duty utility knife, a safety ruler, and a corner rounder. Starting with a 24” roll of magnetic vinyl, you can cut it to the desired size with a good safety ruler and Olfa knife. Then apply your vinyl graphics and finish by rounding the corners. This is done, surprisingly enough, with a corner rounder. This reduces the aerodynamic drag of the sign when applied to a vehicle. It also reduces the likelihood of the sign scratching the vehicle’s paint as it’s moved. Or you could take the quick and easy option of buying magnetic sign blanks that are pre-cut with rounded corners. We offer these “ mag sets” in pairs for easy production of door signs at a minimal cost of less than $10.00 a pair. These are not only affordable and efficient, they’re highly rated by our customers. What about equipment? Don’t you need a Pro Series vinyl cutter or solvent printer to crank out high quality magnetic signs? More on that later. Right now, let’s look at the markets and margins for magnetic signage. Magnetic signs priced fairly can generate significant revenue for your sign shop. Fig 4. The target market for magnetic signage varies depending on the size and form. Magnetic signs are traditionally used by entrepreneurs and micro businesses who need to advertise their enterprises but don’t have commercial vehicles; realtors, tax preparers, landscapers and the like. And when you take that order for a pair of magnetic door signs, why not offer to create matching magnetic business cards? This kind of small scale commercial signage may be just what that customer needs to fuel the growth of his or her business. You may be helping them to grow into a steady repeat customer of traditional commercial signage. That’s why it’s important to establish the principle of charging based on what your signs are worth, not what they cost to produce. The industry standard for magnetic door signs is about $49.00 per pair, but some sign makers charge as much as $199 or more–and get it–because of the value of their designs. Eye catching design, multiple colors, and digitally printed graphics all make even small magnetic signs more effective– and therefore more valuable. With a burgeoning craft and hobby market for digitally produced graphics, there are other applications for images output to magnetic vinyl and paper. These customers don’t see magnetic signage as an investment, so you may have to treat them a little differently. But don’t sell your wares too cheaply, even if they’re only for indoor personal use. Your time and talents are valuable. This digitally printed magnetic sign was printed on vinyl first, then applied to the magnetic sheeting. Fig 5. If you have a digital printer, such as our PrismJET or Mutoh ValueJet, you simply print on vinyl and mount the vinyl to the magnetic sheeting. Then you can trim the sign and place it in a corner rounder to get the look of a direct printed magnetic sign blank. Or, you can print and contour cut the vinyl to fit your magnets using a PrismJET VJc system, then mount them to the pre-cut blanks mentioned above. (as seen in FIG 4) If your only need for a printer is for magnet sized images you can also purchase a PrismJET VJ24 and print directly to 20 mil magnetic vinyl. There are some important caveats. Get more info here. And remember that using the power of full color and photographic elements produces a magnetic sign that’s more effective and more valuable. Charge accordingly. It’s tempting to try to print and cut magnetic vinyl. Be cautious about loading magnetic sheeting in your printer or cutter. These devices include components controlled by precisely calibrated electromagnetic currents. A powerful magnetic field can disrupt the operation of some of these components and cause the device not to work correctly. We have seen the use of magnetic media disable optical registration mark sensors. Proceed with caution. As noted above, the thicker the magnetic media, the more magnetic strength it has. The Graphtec CE5000 and FC8000 series have platens loaded with ferrous metals. Magnets respond accordingly and stick to the platens which means they can’t be fed trough the cutter. Putting transfer tape on the magnet doesn’t work. We’ve tried that. Many, many magnetic signs are simply flexible magnetic sheeting with vinyl letters stuck to them. (The opening figure 1, above, is an example of this.) You don’t have to print digitally to make an effective magnetic sign. It’s quick to produce and can be very effective. Every magnetic sign sale should get a copy of these installation and maintenance instructions! Fig 5. No article about magnetic signage would be complete without some important cautions on proper care of applied car door magnets. Since magnets are intended as removable and re-positionable graphics that are affixed without adhesive, they present unique challenges. The two most common reasons for problems with applied door magnets are improper care and improper installation. Since the installation is your job, let’s tackle that one first. Installation: What you want to avoid is migration. Migration occurs when moisture becomes trapped between the magnet and the painted metal surface, which then causes various chemical reactions. These chemical reactions then migrate to the vehicle’s surface causing permanent staining and bonding to the automotive finish. Removal can cause severe damage to the paint and your reputation. This can be avoided. Migration is more prevalent in lower quality magnetic sheeting and almost never occurs with higher quality products like those available from SignWarehouse. Our Magnum Magnetic and white EnduraMag products are among the best in the industry in migration resistance. But even a good quality magnet can migrate if three conditions are present: uncured paint, high surface temperatures, and improper maintenance. Never apply magnetic door signs to a new or newly painted vehicle. Automotive paint less than 90 days old is chemically unstable. A magnet applied to such a vehicle will experience migration in high surface temperatures typically found in the southern and southwestern US. Always ask about the age of the vehicle and the condition of the paint before completing the sale. Then emphasize that continual maintenance is required to avoid the sign permanently sticking to the car door (see below). If you find yourself facing a customer with magnets stuck to his or her vehicle, the best option for safe removal is to steam the magnets off. But an ounce of prevention is worth a pound of cure. Maintenance: After completing the sale, make sure your customer knows how to care for the stunning magnetic signs they just bought. Improper end user care can result in damaged signs or damaged paint. The signs should be removed regularly (at the least, weekly) and the area underneath should be cleaned, dried, and waxed before reapplying. For your convenience we have a magnetic signage care and maintenance guide on our website designed for your customers. Click here to download the document. You should download this and provide this instruction sheet to everybody that buys a set of magnetic signs from you. And take the time to go over the key points when they are picking up their signs. Set the customers expectations properly, and you will great repeat business. 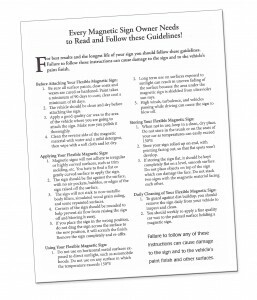 Keeping these guidelines in mind, you should now be more prepared to add profitable magnetic sign blanks to your sign making repertoire and help today’s entrepreneurs become tomorrow’s business leaders.